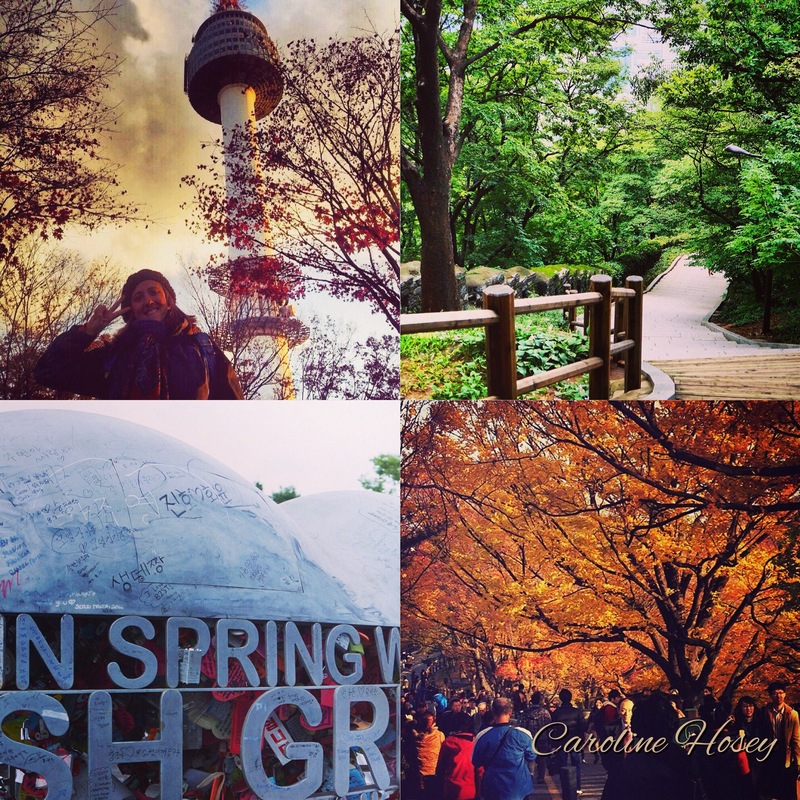 Seoul tower is a must see for any tourist, expat, or even local. 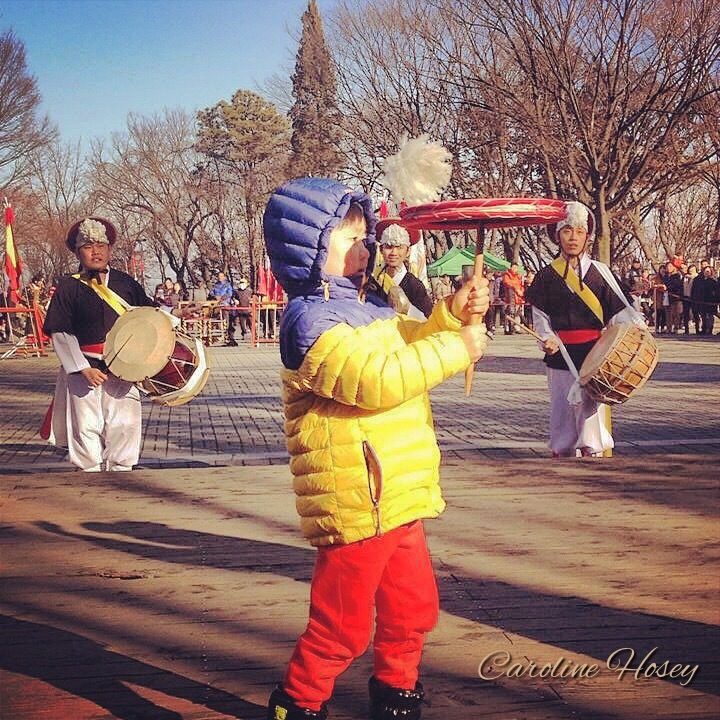 It is the icon of Seoul, and it captures many aspects of Seoul’s culture and people. 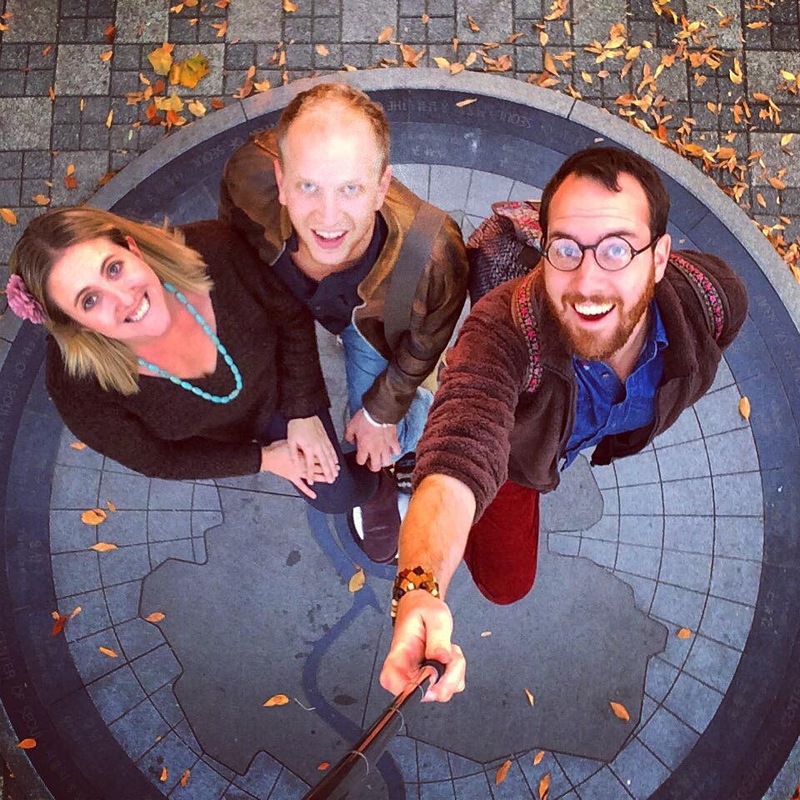 It is also bustling with travelers from around the world, so it’s a great place to experience how Seoul is quickly becoming an international metropolis. The trails are stunning year round. In the spring the roads are covered in cherry blossoms, which creates a very romantic atmosphere if you are going with a loved one. In the summer the leaves are lush and green, and you can listen to the birds chirping in the trees. In the fall, the leaves change to vibrant hues of red and orange. And the fallen leaves decorate the trails. 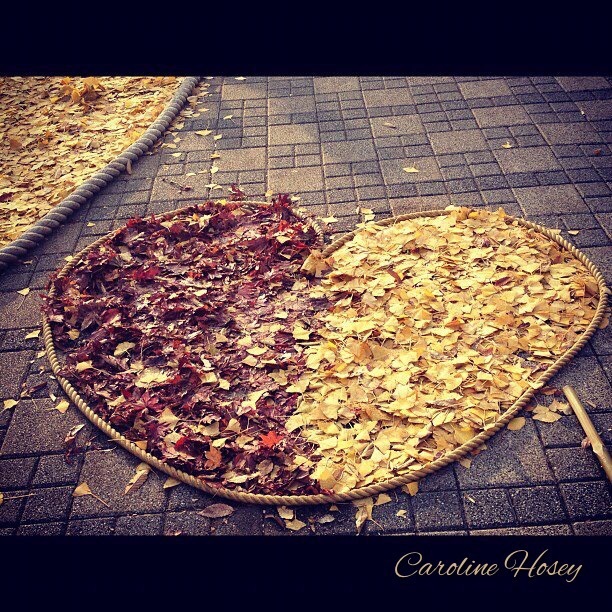 Some people even take the fallen leaves to create designs and art. Though the trees are bare in the winter, it makes the cities landscape easier to see, since there is no foliage to block the view. Seoul tower first opened on October 15, 1980, but in 2005 it underwent a 15 billion won (about 14million USD) remodeling project. 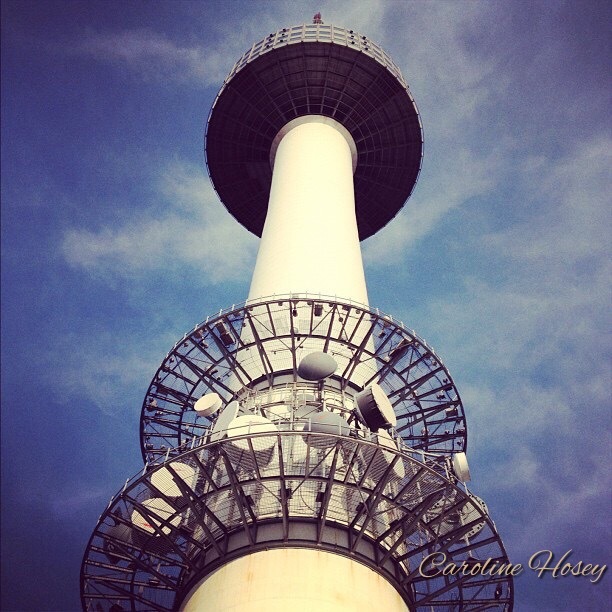 It was renamed “N Seoul Tower”, the “N” Symbolizing “new look”. 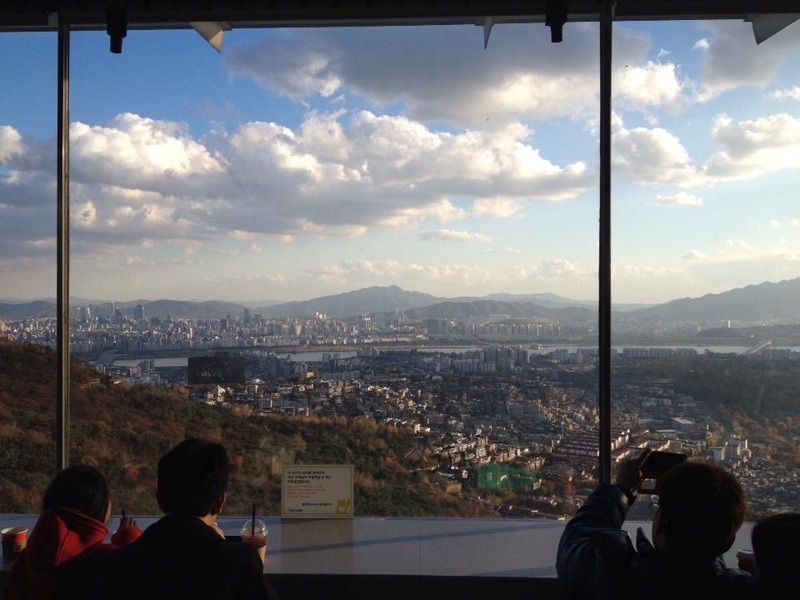 The tower stands at 236.7 meters tall on top of Namsan Mountain, and offers panoramic views of he city sprawl, Han River, and surrounding mountain landscapes. The observation deck is open from 10am-11pm Sunday – Thursday, and 10am-midnight on Saturday and Sunday. 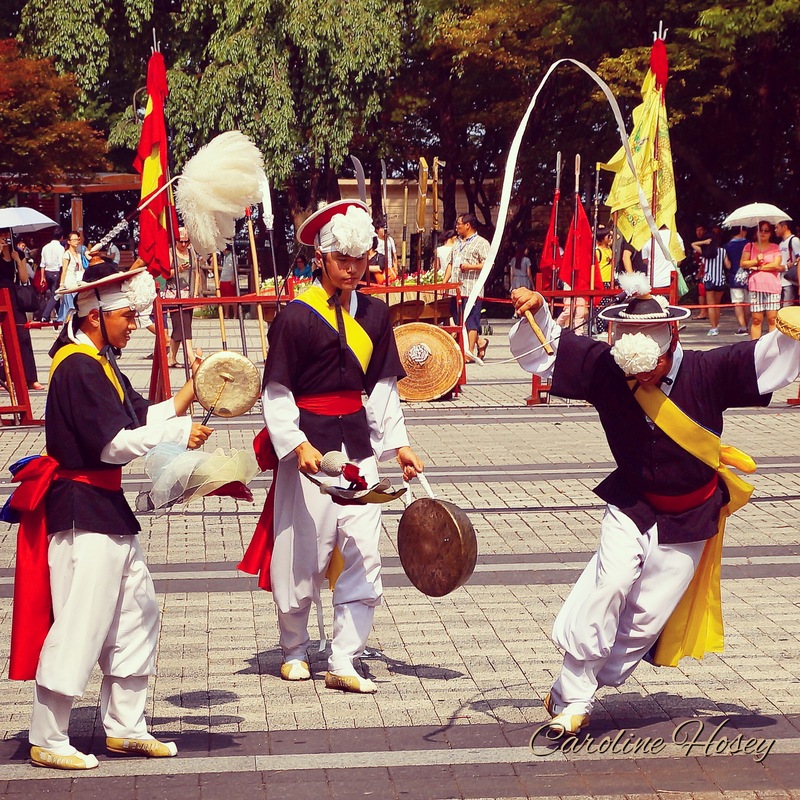 Throughout the day there are martial arts presentations along with other Korean folk performances in the plaza facing the tower. 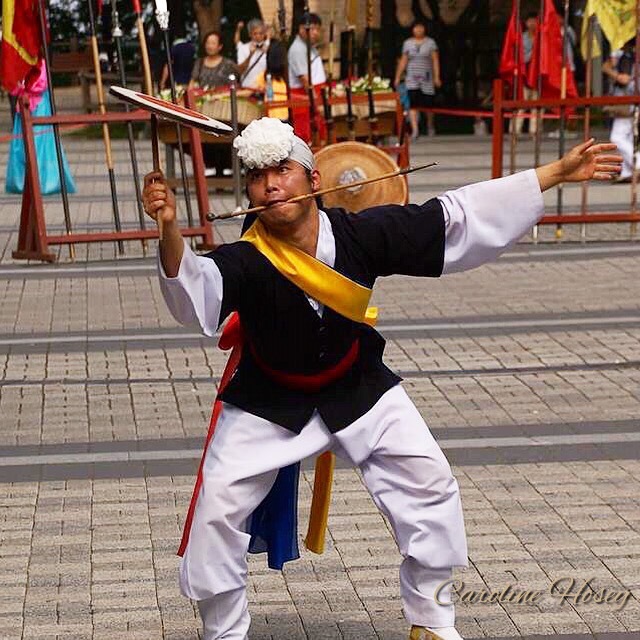 Viewers can enjoy an array of colorful costumes, and listen to the sound of the beating drums and Korean folk instruments. The martial arts presentations are quite impressive as they demonstrate customary swordsmanship and exquisite spear fighting techniques. They also select audience members to try various activities or games. After checking out the folk performances, I usually go for a snack from one of the restaurants or cafes on the main levels. There are quite a few options, but I have a few routine favorites. I’m a big fan of movie-style popcorn, so I usually go for a popcorn/soda set from the snack shop in the B1 level. I also enjoy grabbing a coffee from Twosome Place cafe. However if you are there around lunch or dinner, there are some great places to grab a meal too! There is a place called “The Best Burger in Seoul” where you can have delicious, handmade burgers. They also serve hotdogs, nachos, fries, and some chicken dishes. Their burgers are quite decent, but if you are looking for the actual “best burger” in Seoul, you might want to save your appetite for one of the restaurants in the Haebangchon (HBC) neighborhood. If your tastebuds are requiring a more local flavor, check out “HanCook” which is also on the main level. HanCook features classic Korean dishes such as bulgogi, braised short ribs, and delicious seafood courses. The price for lunch is around 30,000 won and 43,000 for dinner. Personally, I feel this is a bit pricey for Korean food, but I guess you have to consider that the location and atmosphere are fantastic. Finally, you can also try an Italian restaurant called ” The Place” on the second level, or if you want a fine dining option, consider “N. Grill” for top notch French cuisine with a stunning view. 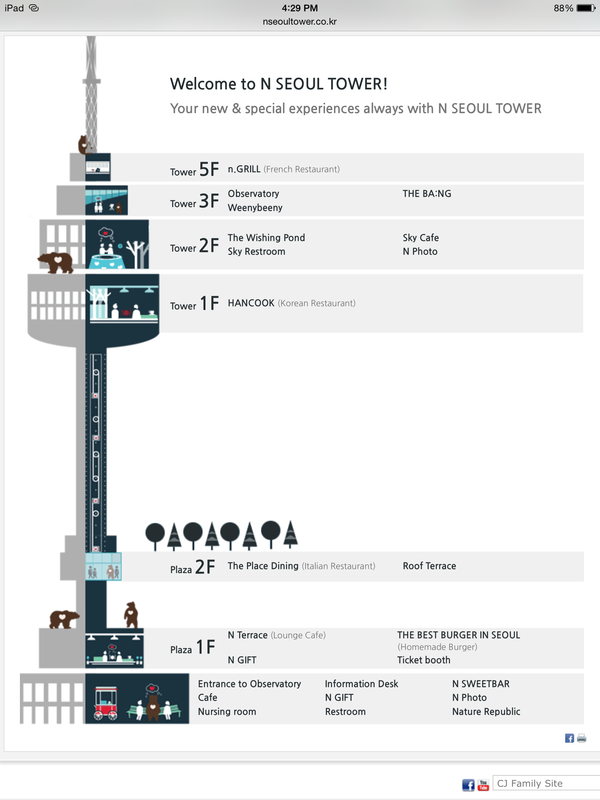 N. Grill is located on the top level (5F) of the tower, and it is highly recommended to make reservations in advance. After grabbing a snack, I generally enjoy checking out the roof terrace which features the famous love locks. 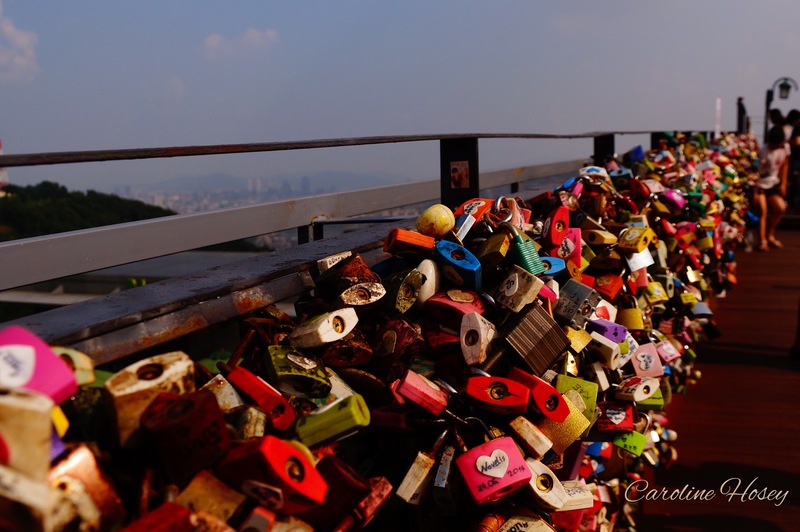 The love locks started after a popular Korean drama featured a couple who chained two locks to a fence to show their undying love for one another. Today there are tens of thousands of love locks attached to the safety fences around the tower. 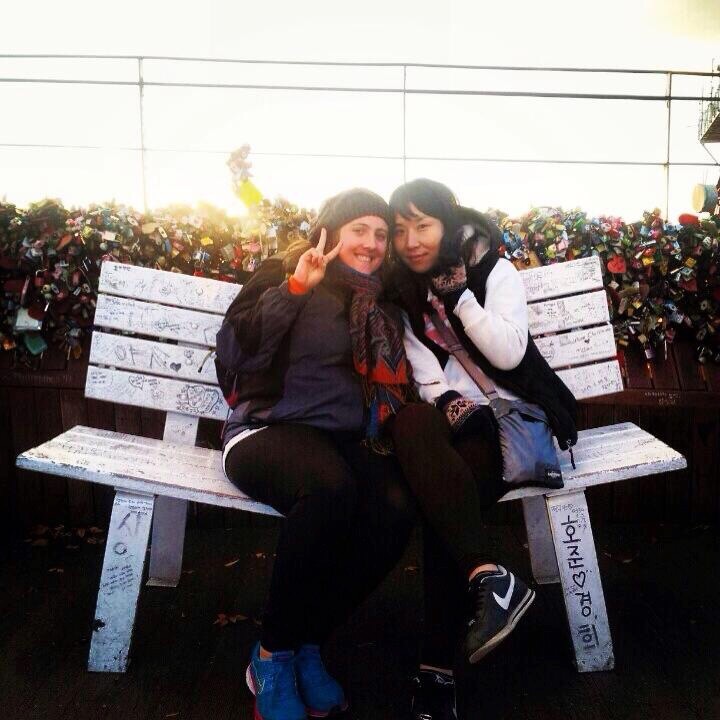 The love locks gained such popularity, that they have even created sculptures for couples to attach their locks. If the love locks are not enough PDA for you, there are also benches that are slanted in the middle, so couples and friends can sit closer together. Expect lines of people waiting their turn to snap a selfie, as Asian culture really loves taking photos. 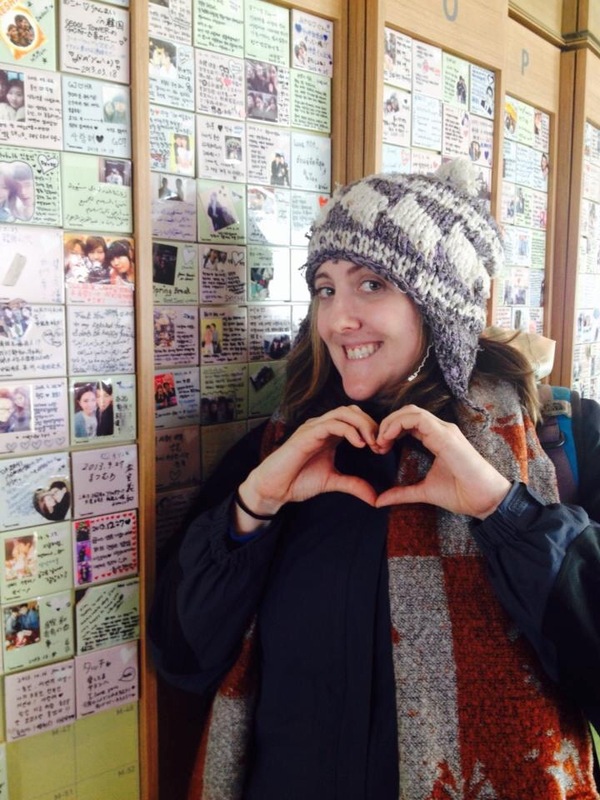 Furthermore, inside the tower there are tiles with couple’s photos and love notes. 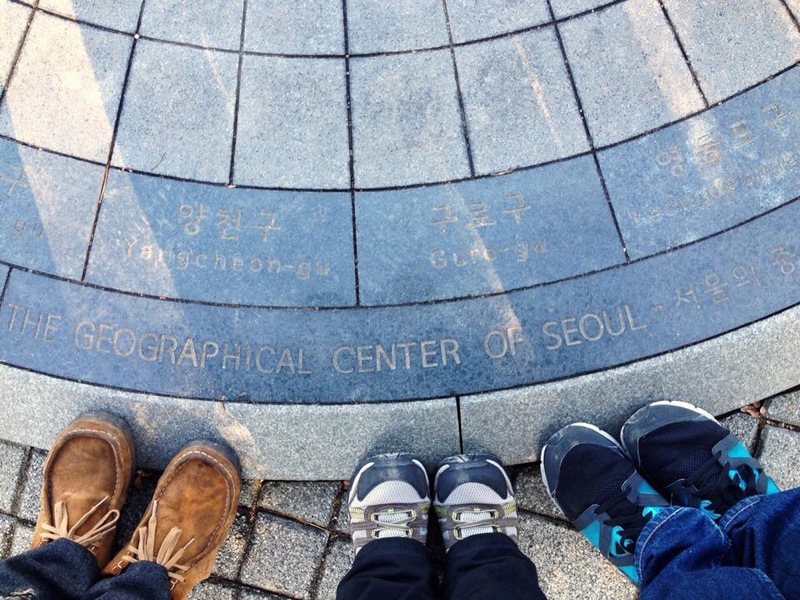 Finally, the last thing you should do is stand in the geographical center of Seoul. The spot is on the far side of the plaza facing away from the tower. It is kind of tucked away in the back corner, so it is easy to miss. However, it is a great place to snap some photos, because it is less crowded than the other areas. Also there are stunning views of the cityscape from that direction. Now I imagine you are wondering how exactly to get to Namsan. I’m going to first tell you my favorite hiking trail, then I’ll post the other routes and useful information below. My favorite trail starts at Donguk University station on Line 3. You walk out of exit 6 and head towards the left through the park. 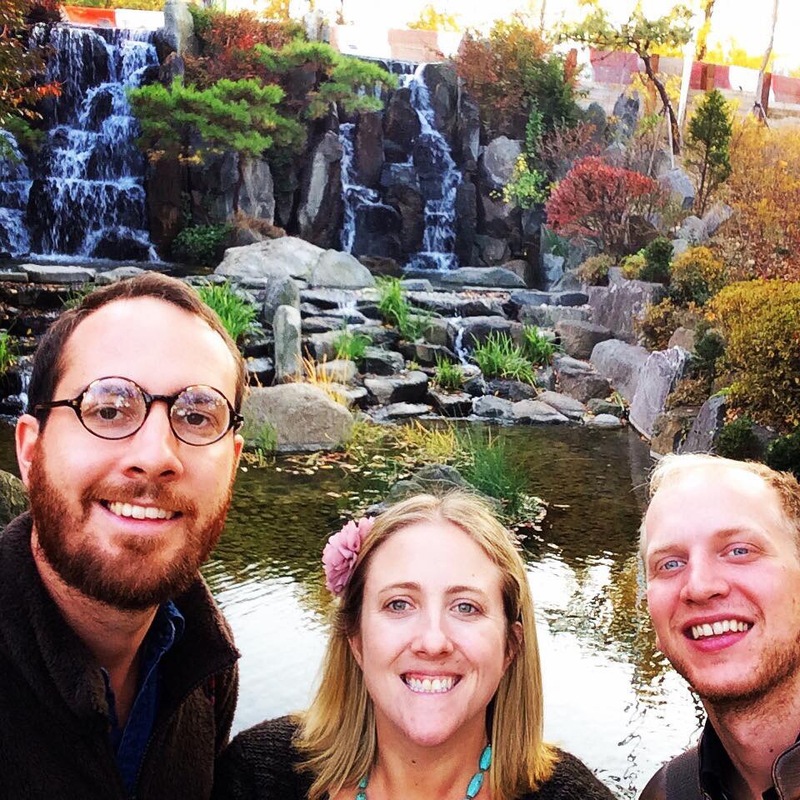 The park itself has a stream flowing through it and some pagodas to add to the scenery. At the edge of the park there is a small man-made waterfall, and it’s a fun place to take a picture before getting sweaty from the hike. 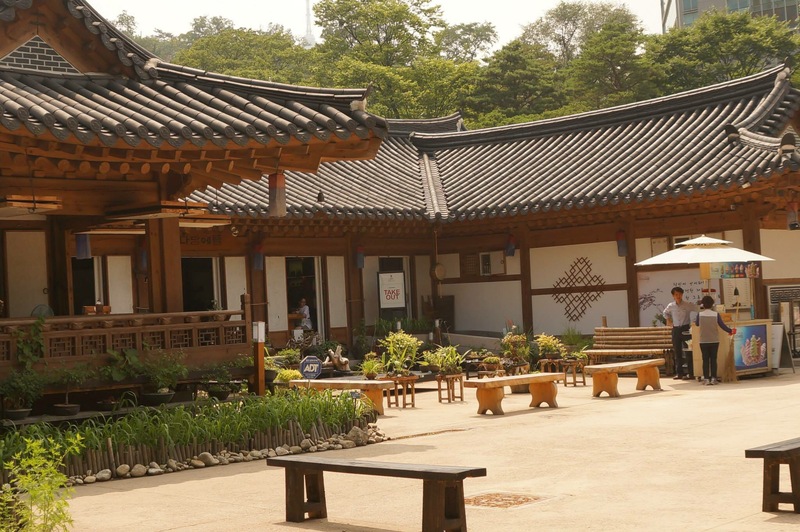 Next you will see a building that is built to model traditional Korean architecture. It has a public bathroom if you need to use it before starting the hike. I’m not actually sure what the purpose of the building is for, as I never go inside, but maybe it’s worth checking out if you are curious. Across from the park will be a set of stairs. Once you find the stairs you are on your way. Follow the signs along the path, as there are a variety of trails you can try. 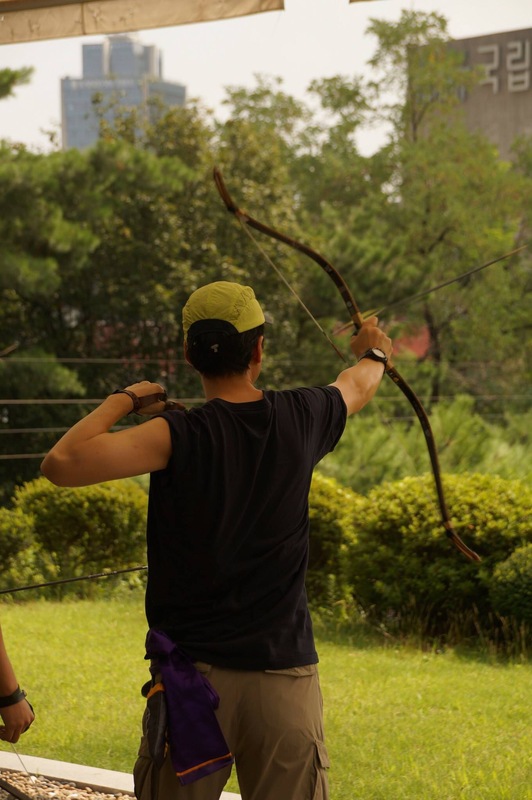 Along the road, there is an archery field where people shoot arrows from long distances. 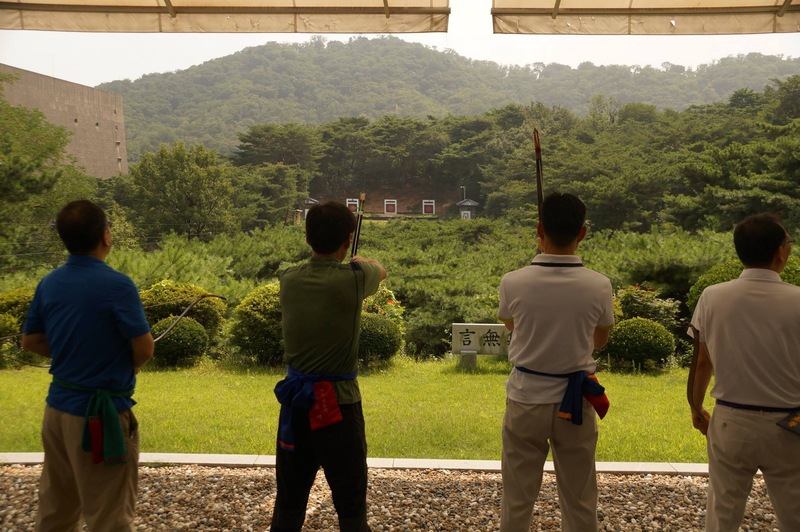 It’s a pretty incredible spectacle to watch, because the targets are placed very far from the shooters. My eyesight is pretty good, but I’m unable to even see if they actually hit their targets. However it’s a nice little pitstop during the hike. -Boarding point: Upon getting off from Myeong-dong Station (Seoul Subway Line 4), Walk out of exit 3 and continue for about 15 minutes to reach the street laying next to Pacific Hotel. The boarding place should be seen. -Take the bus from the closest subway station: Chungmuro Station (Seoul Subway Line 3, 4), Exit 2 (in front of Daehan Cinema) or Dongguk University Station (Seoul Subway Line), Exit 6. -Take the bus from the closest subway station: Seoul Station, Seoul Square (Seoul Subway Line 1, 4), Exit 9 or Itaewon Station (Seoul Subway Line 6), Exit 4 or / Hangangjin Station (Seoul Subway Line 6), Exit 2. -Take the bus from the closest subway station: Myeong-dong Station (Seoul Subway Line 4), Exit 3 or Chungmuro Station (Seoul Subway Line 3), Exit 2 (in front of Daehan Cinema). -Interval: every 15 min. 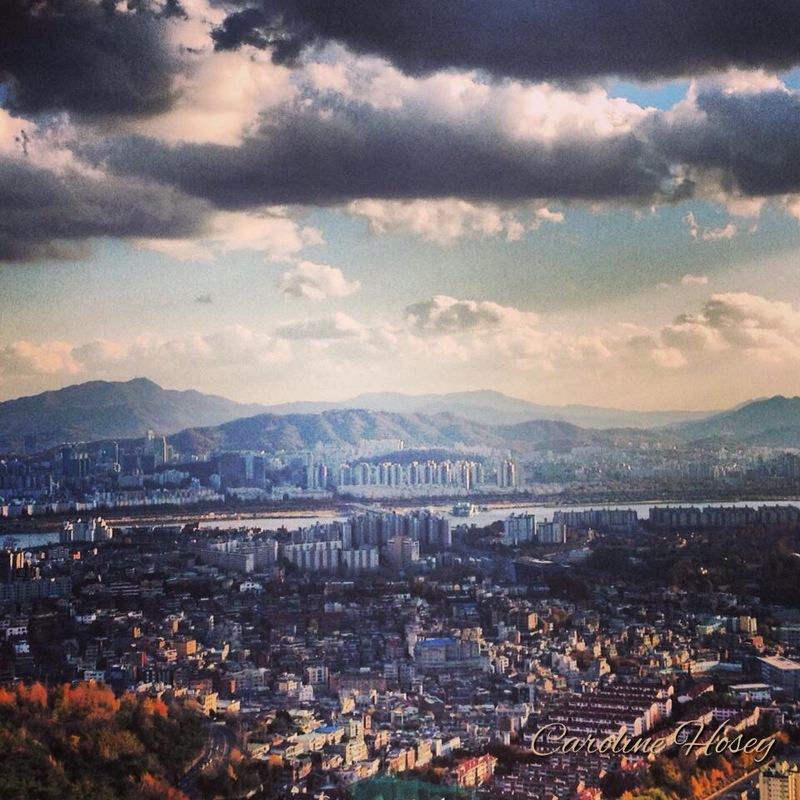 I hope this helps anyone interested in visiting Namsan. 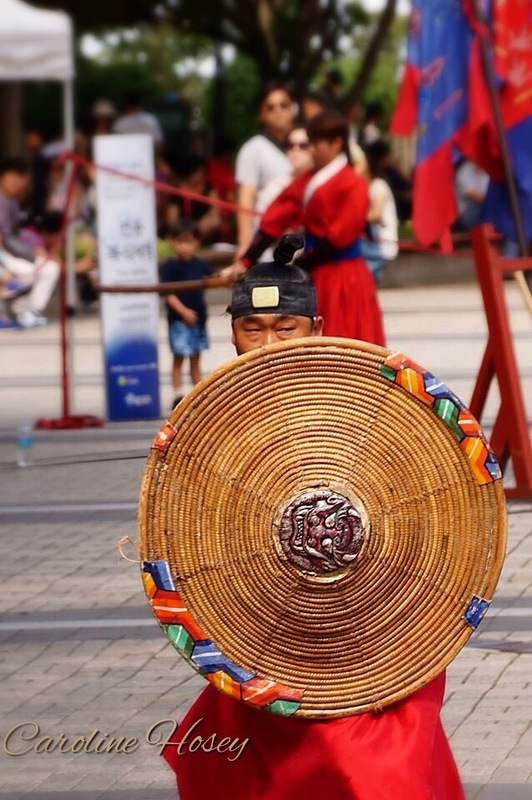 I feel that in order to experience the heart of Seoul, this is a must-see stop! Please leave questions or comments below if you need any suggestions or want to share your experiences.